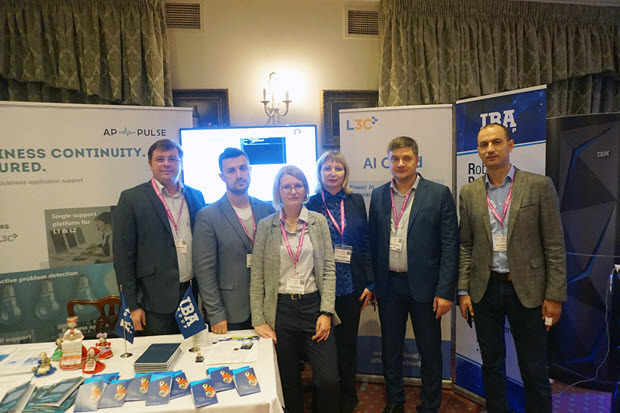 IBA Group presented APPULSE, a new Artificial Intelligence (AI) solution, at the GSE UK Conference held from November 5 to November 7 at Whittlebury Hall, Northamptonshire, Great Britain. The conference gathered more than 500 executives with responsibility for mainframe-based services, mainframe specialists in all disciplines, and application developers. GUIDE SHARE EUROPE (GSE) is an international non-profit association of companies, organizations, and individuals involved in Information and Communications Technology (ICT) solutions based on IBM architectures. GSE UK is a non-profit IBM user group that has been active since 1959. The idea of the GSE UK Conference, now in its eighth year, is to exchange experience and information related to IBM software and hardware, and influence product and service providers. Better, stronger, faster; The Mainframe….. the Machine! is the motto of the event. The 2018 GSE UK Conference provided intensive education across a broad range of mainframe topics. Highlights from the agenda included Zowe, the first open source project based on z/OS, the seven ages of mainframe, and Artificial Intelligence. The full agenda comprised up to 15 streams and more than 100 presentations. At the conference, IBA Group presented its newly-developed solution designed for monitoring and support of business applications that run on z/OS servers. A centralized platform for L1 and L2 support, APPULSE covers a full support cycle, from proactive problem detection and automatic ticket creation to stakeholder notification, and solution generation and execution. The AI platform embedded in APPULSE is capable of automatic generation of solutions for typical problems in application support. The APPULSE platform solves a whole range of problems that support teams face in their everyday activities. APPULSE provides a single entry point for distributed business applications and shortens the problem management lifecycle. It ensures uninterrupted operation of critical business applications and guarantees business continuity. Using APPULSE, customers digitize, accumulate, and share experience of support teams, increasing their performance. As IBA Group has been an IBM business partner since its creation in 1993, the new solution accumulates the company’s long-term experience in mainframe development and support.